The Hours - My Memoir: A Brief Encounter With Kolkata! A Brief Encounter With Kolkata! On our way to Sikkim, we had stopped at Kolkata. This post gives a brief but horrible experience we had in the city. On November 10th, at 4:00 AM, P & I left to Bangalore International Airport. Impressed by the infrastructure and facility at the airport, we boarded our Air India flight at 6:15 AM to Kolkata. Our Kingfisher flight to Bagdogra got re-scheduled to 3:15 PM from 11:40 AM. 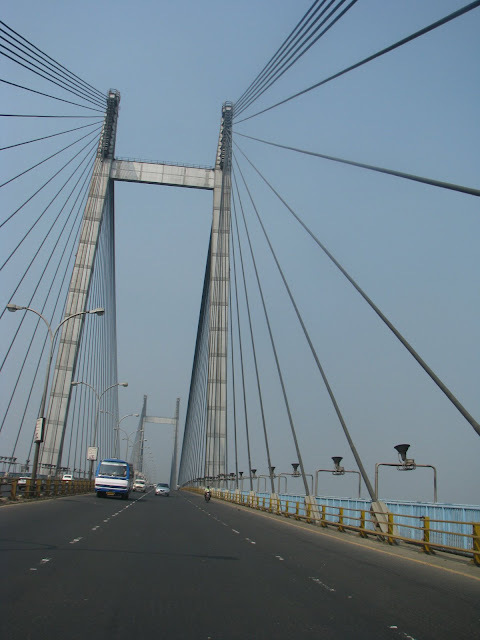 While wondering what to do, P suggested that we take a tour around the city of Kolkata. We set off on a taxi, first to a Kali temple. The temple is situated in a very congested area; several shops and countless people; and yes, agents who offer Darshans and poojas to us. As we got down the car, a bunch of agents came running to us asking for a package for the Darshan; if we denied their help or commission, they did not allow us to park the vehicle. Disgusted, we finally agreed to one agent for Rs51. He took us into the temple premises; here we saw goats being sacrificed. At main shrine, there were more agents, who appeared to be me as though hanging from walls and pillars of the temple. Few even blocked the view of God and only let some to climb up a step for better view. I was lucky to be pulled up in that crowd and get a glimpse of majestic idol of goddess Kali with her intense eyes. The agent asked me to offer a dakshina of Rs101 to God. I refused and offered only Rs10. He warned me that the price had to be as he had mentioned; I replied that God would not fix prices for Dakshina. Tired from the crowd we wanted to escape, but our agent took us to some pandit even after we refused. On the way, few people asked us to wear a red thread around our neck, when refused; they forcibly put it around our neck and told that they did not expect any money. Everything was happening so fast in that crowd that we failed to rebel. The pandit started chanting some mantra; well they were not Vedic chants, but just words in Hindi asking God to bless us. He said to us that he needed no Dakshina from us and handed over a packet of Prasad and after a while asked us for Rs101 as dakshina to God. When I refused to give, he asked back the Prasad. By now we were extremely angry by the behavior of people at the temple and headed back. While returning back, the people who had offered the red-thread, started asking us for some money or to return the thread back; we returned that too. My angry and irritated mind failed to understand if God even existed in such Chaos, created by these people. When I could not feel Bakthi in the shrine, I realized that to me God did not exist here. God’s presence according to me is felt through Bakthi; to my south Indian/ Mangalorean mentality bakthi originates in peaceful temple shrines as I watch, from a distance, the beautiful glowing idol of God which is illuminated by the light from a lamp; where Brahmins who perform pooja, strictly maintain Maddi (Purity) and respect the Vedic chants. We scolded the taxi driver for bringing us here and out of anger, even mentioned that this is the worst city we have been to. The driver then explained to us that the people at the temple were Bihari’s and not Bengali’s; the agents were all Bihari people who had migrated here. This disgusting experience had spoiled our mood to see anything more in the city. We drove to the Second Bridge; a suspension bridge, from where we could see the famous Howrah bridge and drove around the majestic Victoria memorial. I asked our driver to take us to a KC Das outlet and then directly to the airport. We went to a KC Das outlet near airport. Rasagulla and Rasmalai tasted like heaven. P & I discussed the horrible experience we had at the temple. It was clear that this temple was a source of income for so many people, who wanted to make easy money out of nothing. Population & unemployment, we thought were the major cause to such behaviors from people. In spite of all that reasons and answers, I was extremely hurt by the way; these people were representing our Dharma and bringing ill fame to it. Perhaps, this experience became a reason for us to fall in love with the beauty of Sikkim and its wonderful people, even more than what we would have felt otherwise. It was literally as though running out of city life; out of chaos, to some place more serene and quite. I too had a very bad experience in Cal on my way to Sikkim, though it was different..and thats why the next trip, I just stayed in the dirty airport..so how was sikkim ? Lakshmi...What was your experience in the city? Sikkim was amazing...more about it in next post. I am so scared to be in that city that whenever I was alone there and had to hire a taxi, I used to search for a Sardaarji taxi driver. Things have gone smoothly, touch wood. @Indrani - Any bad experience you had there? @Hillary - Welcome to my blog. Yes the rest was amazing...soon to follow. Never been to Kolkata but your experience warns me to be extra careful. These so called pundits are always money minded. Cuckoo - Well, I wont say the city is bad, but the experience we had was definetly not the one i would like to remeber. Matilda - True...Well, its only one bad experience i guess, I am not generalizing it to the entire city. Congrats !! I appologise for sending my wishes so late....!! I am looking forward to your post on Sikkim and your impression of same- my cuz took his partner there and they just loved it!! Sad to hear about Cal experience...may be timing was not right !! Sikkim is superb place to be in...Very serene...Well By the way, where have you been all this while? No updates on blog as well? Wud love to see Preethi via ur blog, it is possible?